Mr. Dalton has just left me; he sets out to morrow for Massachusetts, & is to take charge of this letter- We still are all well—Yesterday in Company I was told your brother Fredk had been married three weeks; I replied I had not been inform’d of it—today P[eter] Munro [Jay’s nephew] came here to let me know that it was a fact tho he had not had it from your brother. Peggy Munro & myself wish Your opinion respecting the line of conduct proper for us to observe as yet we remain in ignorance respecting it—but perhaps she may deign to inform me of it. . . .
Last Tuesday the Captn of an Halifax vessel called upon me w[ith] an order from Mr. Craighton for one hundred & twenty dollars for the passage of Mr. Craighton & family—I told the Captn that you was in Boston & that I had recd no information from you that such an order was expected consequently could not accept it—the weather has been disagreeable ever since, so that I have not seen either Mr or Mrs Craighton—. . . .
What patriotic services had Mrs. Creighton performed? Had she been a spy for Jay? It’s an intriguing mystery. Mr. Creighton was able to resume practicing law in New York. Jay had also been sympathetic to another Loyalist, his longtime friend Peter van Schaack, who had settled in London during the War but was able to return in 1785. John’s youngest brother, Frederick Jay (1747-99), known as Fady, had lost his wife Margaret Barclay Jay very unexpectedly on October 28, 1791. It is no wonder that Sarah was at a loss upon hearing of his wedding so soon after. . . . . I wrote you in my last by Mr. Dalton that your brother Fredk. was married, but believe I did not mention that it was to Miss [Euphemia] Dunscomb. It seems he was already married when you left town, his wedding being on the 10th of April. Mr. Jay’s relations resent the want of [respect] to her memory so much that none of them visit either him or his wife. Last Saturday just as P[eter] Munro & myself were deliberating what was to be done on our part, Fady came in. I suppose said he advancing towards me you have heard that I am married again. I have Mr. Jay, but not being authorised from you to believe it, did not credit it. It’s true said he, I am. Will you take a chair Mr. Jay? No, I must be going, good bye. Good by Mr. Jay, that is all that has passed between us. . . .
Don’t you love the way Sarah writes dialogue in her letter, as in the recounting of her conversation with Fady? It conveys a sense of immediacy, and is altogether charming. The Selected Papers of John Jay, 1788-1794, Elizabeth M. Nuxoll, editor (Charlottesville: University of Virginia Press, 2017], vol. 5, p. 333-4, 403-4, 411. Also Selected Letters of John Jay and Sarah Livingston Jay Landa M. Freeman, Louise V. North, Janet M. Wedge, editors (Jefferson, North Carolina: McFarland & Co, Inc., 2005], 208. 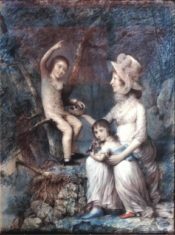 The portrait of Sarah Livingston Jay and her children is by James Sharples (1751 or 1752-1811); it is at the John Jay Homestead State Historic Site.